It's freezing, but where can the US's homeless go? 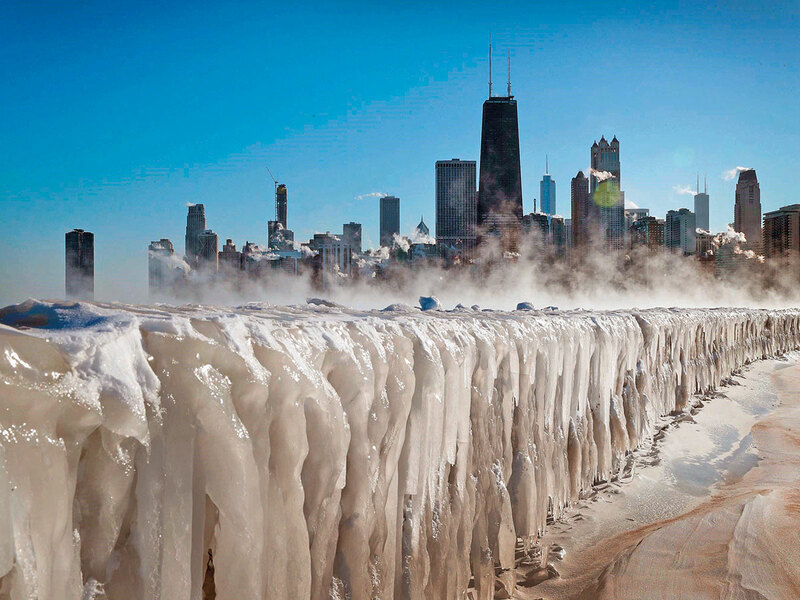 CHICAGO: The painfully cold weather system that put much of the Midwest into a historic deep freeze was expected to ease Thursday, though temperatures could still tumble to record lows in some places before the region begins to thaw out. Disruptions caused by the cold will persist, too, including power outages and cancelled flights and trains. Crews in Detroit will need days to repair water mains that burst Wednesday, and other pipes can still burst in persistent sub-zero temperatures. Before the worst of the cold begins to lift, the National Weather Service said Chicago could hit lows early Thursday that break the city’s record of minus 32 Celsius set on Jan. 20, 1985. Some nearby isolated areas could see temperatures as low as minus 40 Celsius. That would break the Illinois record of minus 38 Celsius, set in Congerville on Jan. 5, 1999. The blast of polar air that enveloped much of the Midwest on Wednesday closed schools and businesses and strained infrastructure with some of the lowest temperatures in a generation. The deep freeze snapped rail lines, cancelled hundreds of flights and strained utilities. Chicago dropped to a low of around minus 30 Celsius, slightly above the city’s lowest-ever reading of minus 32 Celsius from January 1985. Milwaukee had similar conditions. Minneapolis recorded minus 32 Celsius. Sioux Falls, South Dakota, saw minus 31 Celsius. Wind chills reportedly made it feel like minus 45 Celsius or worse. Trains and buses in Chicago operated with few passengers. The hardiest commuters ventured out only after covering nearly every square inch of flesh against the extreme chill, which froze ice crystals on eyelashes and eyebrows in minutes. The Postal Service took the rare step of suspending mail delivery in many places, and in southeastern Minnesota, even the snowploughs were idled by the weather. 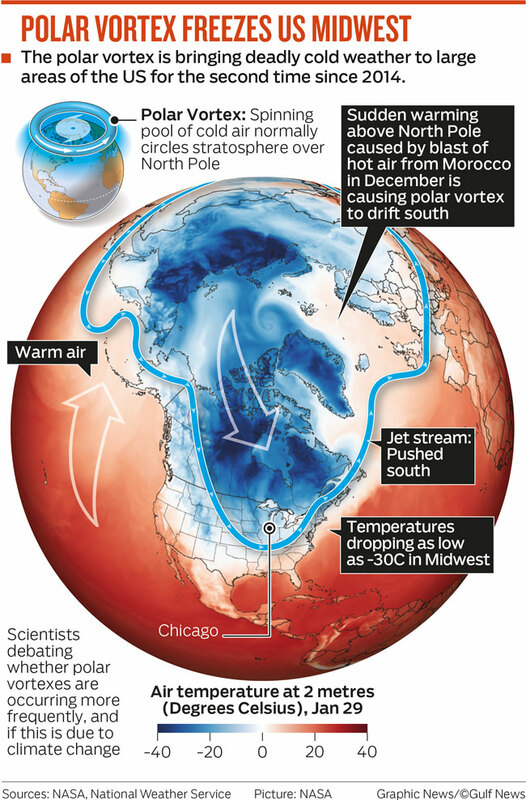 The bitter cold was the result of a split in the polar vortex, a mass of cold air that normally stays bottled up in the Arctic. The split allowed the air to spill much farther south than usual. In fact, Chicago was colder than the Canadian village of Alert, one of the world’s most northerly inhabited places. Alert, which is 804km from the North Pole, reported a temperature that was a couple of degrees higher. At least eight deaths were linked to the system, including an elderly Illinois man who was found several hours after he fell trying to get into his home and a University of Iowa student found behind an academic hall several hours before dawn. Elsewhere, a man was struck by a snowplough in the Chicago area, a young couple’s SUV struck another on a snowy road in northern Indiana and a Milwaukee man froze to death in a garage, authorities said. Amtrak cancelled scores of trains to and from Chicago, one of the nation’s busiest rail hubs. Several families who intended to leave for Pennsylvania stood in ticket lines at Chicago’s Union Station only to be told all trains were cancelled until Friday. “Had I known we’d be stranded here, we would have stayed in Mexico longer — where it was warmer,” said Anna Ebersol, who was travelling with her two sons. Detroit is in the second year of a $500 million program to rehab its water and sewer system. Last year, 40km of water mains were replaced. The same freeze-thaw cycle beats up concrete and asphalt roads and bridges, resulting in teeth-jarring potholes.